Hi, guys! After some long debates with myself whether to "spam" my blog or not, I'm popping the question here as well. Basically, I need a little feedback from you even if it's just a couple of words on what makes a great blog for you? Although I'm collecting the data for my "Networks and Connectivity" module at uni, I've chosen this topic to hear your opinion on this matter and take some notes to improve my own blog. Those of you who have already commented via Twitter, Facebook or Formspring, please ignore this post, but if anyone else wants to add anything- feel free to comment! Please note, it's not about my blog, but any blogs in general! I'm looking for a pattern as well as something unusual. Originality is very important. I personallt love the lifestyle/personal blogs the most, because you get a glimpse into a person's life (i'm nosy like that) and also a variety of topics (i.e. what blogger got up to, what are they wearing, eating, drinking, cooking etc, how are they feeling, their views on certain things and so on). I think that blogs have to have a main theme they follow but also they have to have diversity. For me it is also important photos..even more important than text. Photos should be interesting and it's a big plus when professionally done. Great blog is definitely not boring and I do not support the idea that if there is nothing to write about and no photos, blogger makes a post just because she/he has an idea that blogger has to post every day (though the post has no esthetic or readable value). I'll 90% subscribe to a blog if there are high-quality pics of blogger's everyday life. This way I can explore the personality, see what's hidden behind the words. Anyway we're always looking for interesting and beautiful people to communicate to - and if a blog helps us in that it's a success. и на десерт чудные иллюстрации,видео, передающие чувства автора. Секрет прекрасного блога ты знаешь,т.к. далеко не я одна тебя обожаю,жду каждый пост как манну небесную)удачи с докладами. I love blogs that are unique, especially when it comes to fashion. Bloggers who you see their own personality shine through- not who they want you to think they are. Also, consistent posting and great pictures are important to me. Oh, and bloggers who are still "humble" about who they are. Having someone respond to your comment ( if a question was asked) or e-mail really means a lot to me. It shows they appreciate your support and take blogging seriously. I look at the photography first and foremost. Beautiful photos and a beautiful model. You're so gorgeous and everything looks great on you. Happy early birthday! I like blogs that are different, with it's own voice. For example, I wouldn't want to visit a blog that has posted about a particular brand that 5 other blogs mentioned the same day. Stay true to what you like and what interests you. Make sure you post the results! I am interested myself as to what people consider to be the elements of a great blog. In my opinion, the blogger attitude towards the readers is the most important, because it can be seen in almost every aspect of a blog: pictures, notes and etc. It's always nicer when photos are of good quality and the layout is very simple, that makes everyhing look clear and shows that the blogger really cares about the readers. I rarely go back to blogs in which the layout is "messy" (i mean lots of colours and patterns) or when photos are dark and small. It's also nice when blogger shows some of her/his persoanlity and personal life; I don't mean sharing detalils but the general look, just to give an impression that we know him just a litle bit. 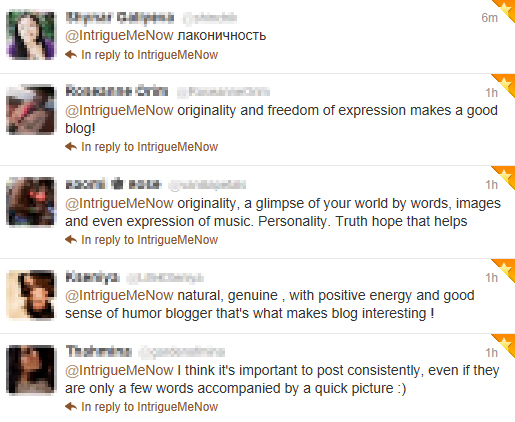 ;) I personally don't like the blogs which author gives an impression that he feels better than the others. It can be felt in the way he writes, what word uses and it's definetely not nice reading such a thing. Apart from that originality, positive attitude and passion are crucial for me. I wrote guite a long note but hope it helps you. Czech republic loves you babe! As a new blogger I am still trying to figure it out but I think for new bloggers its about being genuine and having good content. For popular bloggers it doesnt really matter half of the time they just repeat the same thing over an over again because they have established readers and traffic and even if they just post a picture of their toe people will like it and commend them for it. that's my two cents. Thank you so much everyone! I have succesffuly passed my assignment but you can still keep the comments coming if you wish as I am taking them all in consideration anyway. It was extremely interesting and useful to hear your thoughts on this matter! Couldn't agree more with your comments, I'm gonna make sure to share all gathered information with you shall you find it useful as well. Laconic, leaving your readers want more, intriguing (ironically) them, and of course staying true and honest and not selling out! U tebja klassnqj stilj i tq neobqknovenno krasivaja,smotretj tvoj blog-eto udovolstvie.Vsjo o4enj izqskanno i so vkusom. also - have a WONDERFUL birthday! I think people want likeability and a connection. As a blogger you have to be honest and just say how you feel, write about yourself and your life, and use images so your reader gets to know you a bit more. what makes a great blog? hmm the bloggers mind, creativity, independence, uniqueness and humor. i like to feel like i know the blogger from reading their post. i want to see what is different from their posts compare to others, i like how different they are even though i might not like it....though it will grow on me because am learning, i like to know that your a human, sometimes is nice to wear just a dirty sweatshirt and take a picture instead of a high quality one. that's how i follow blogs. I think original content really makes or breaks a blog. In my own blog, I make all of the graphics, drawings, & I take all of the photos. I don't post something unless it was a photo taken by myself because I want people to be able to see what I see so I can relay the experience to them. I am a new Blogger, and I find it hard to know how far to express myself??? I wouldn’t want to read about extremely personal posts, but I do feel introducing yourself and what you get up to , and so forth is important! You want your readers to feel like they are a part of your blog! I like bloggers who give their opinion, and ask for others as well. Don’t just follow what other people love. Tips and How to are fun! Good Luck! You have a great Blog! CREATIVE AND BEAUTIFUL CONTENT! I am just starting my new blog and you've always been an inspiration!